St. Martin's Press, 9781137279637, 272pp. The true story of a little-known, yet remarkable World War II operation, which had all the hallmarks of a suicide mission. 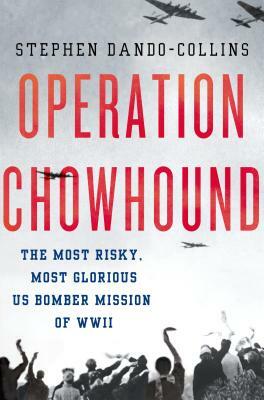 Beginning with a crazy plan hatched by a suspect prince, and an even crazier reliance on the word of the Nazis, Operation Chowhound was devised. Between May 1 and May 8, 1945, 2,268 military units flown by the USAAF, dropped food to 3.5 million starving Dutch civilians in German-occupied Holland. It took raw courage to fly on Operation Chowhound, as American aircrews never knew when the German AAA might open fire on them or if Luftwaffe fighters might jump them. Flying at 400 feet, barely above the tree tops, with guns pointed directly at them, they would have no chance to bail out if their B-17s were hit—and yet, over eight days, 120,000 German troops kept their word, and never fired on the American bombers. As they flew, grateful Dutch civilians spelled out "Thanks Boys" in the tulip fields below. Many Americans who flew in Operation Chowhound would claim it was the best thing they did in the war. In this gripping narrative, author Stephen Dando-Collins takes the reader into the rooms where Operation Chowhound was born, into the aircraft flying the mission, and onto the ground in the Netherlands with the civilians who so desperately needed help. James Bond creator Ian Fleming, Hollywood actress Audrey Hepburn, as well as Roosevelt, Eisenhower, and Churchill all play a part in this story, creating a compelling, narrative read. Stephen Dando-Collins is an award-winning military historian with numerous highly praised books on ancient history ranging from Imperial Rome to the American west to Australia, some of which include Legions of Rome and Caesar's Legion. Today, Stephen’s books appear in many languages and he has an army of loyal readers wherever his books are published around the world, in countries including Australia, the United States, Canada, the United Kingdom, New Zealand, Italy, Spain, Portugal, Brazil, Poland, Albania and Korea.